The cornerstone of the Masonic Temple was laid on Sunday, September 25, 1921 with an estimated 1000 residents, guests, and Masons from throughout the State of Ohio in attendance. The Temple was built at a cost of $20,000 and became the pride of the community as well as of the 225 local Masons who composed the lodge membership. The Temple was planned and constructed by Harry Stafford, local architect and member of the lodge. Concrete, steel, and ornamental brick were used in the construction. 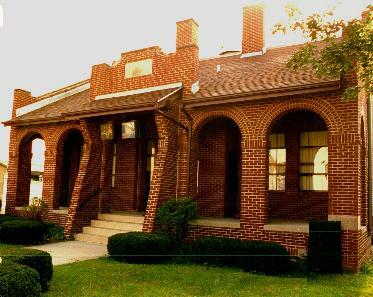 The building was quite modern for that time, with many convenient appointments such as a large and spacious porch, entrance vestibule, dining hall in the basement, waiting and preparation rooms, reception room for the ladies of the Eastern Star and good storage facilities. The interior of the lodge room is well arranged with a balcony adding to the seating capacity and increasing the beauty of the overall effect. The building is arranged so that the banquet hall may be used entirely separate from the lodge room. The Masonic Temple building was formally dedicated and opened on Wednesday, May 3, 1922, and has been in continuous use by the lodge for the past 75 years. Prior to moving into this facility, the lodge met in the three-story building on the north-east corner of Main and Washington Street. This building presently houses Harvey’s “Remember Me” studio and apartments. The lodge convened in these quarters starting in 1850 and continued to meet here for 72 years or until we moved into the present quarters in 1922. Masonry in New Carlisle dates back to the year 1830 when the town was a small village of approximately 100 residents, three churches, three general stores, a physician and a hotel, the New Carlisle Inn. Several residents of the village who were members of the Masonic fraternity, became desirous of establishing a Masonic lodge here and, thus, petitioned the Grand Lodge of Ohio, which granted the local brethren a dispensation empowering them to work. The names appearing on our first charter were David Searl, Master; James Chatlin, Senior Warden; David Cory, Junior Warden; George Croft, T. W. Warms, John H. Steel, John Russell, John Porter and N. B. Searl. The lodge thrived for 3 or 4 years and then became inactive for the next fifteen years. Then, in November of 1850, David Johnson Smith, son-in-law of Elnathan Cory (an early, large landowner in the area) and the builder of the Cory/Smith residence still standing west of town on Route 571, along with Dr. John Stockstill and others, received a new Charter for Washington Lodge No. 100 (later to be named New Carlisle Lodge No. 100) from the Grand Lodge of Free and Accepted Masons of Ohio. The lodge has continued to serve the cause of Freemasonry without interruption since that time. The lodge will celebrate its sesquicentennial or 150th anniversary in the year 2000. Throughout the years, many of New Carlisle’s prominent citizens have participated in the affairs of the lodge, proud of their traditions and heritage, their belief in God, brotherhood, and country and the many Masonic acts of charity and compassion they extend to others. As the world’s oldest and largest fraternity, our goal is to aid in building a man’s most valuable possession – his character!